Even though I’ve already graduated from college — twice — this weekend I found myself making up a batch or three of Jell-O shots in my kitchen. It confused the kids and made my husband a little nauseated, but the fact is Jell-O is gluten-free, vodka is gluten-free, as is tequila and bourbon. So it was really only a matter of time before this happened. However, I was spurred on by the awesome Giuliana over at Lovely Healthy, who came up with this great idea for us to both kind of do our thing, yet in tandem. Giuliana is this amazing, yet allergic, blogger who is all about making delicious, allergy-friendly, healthy recipes, and I’m the gal that will enter that BBQ rib eating contest, as long as it’s gluten-free. 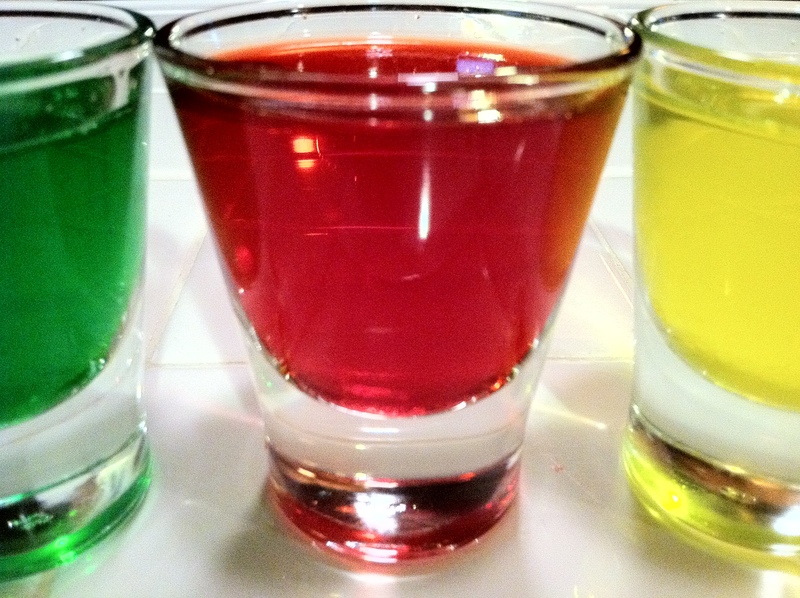 Hence, me doing the Jell-O shots and Giuliana turning this concept into healthy, organic, and probably sugar-free. She’s a pro like that. Not so much a recipe as a delightful pairing recommendation for the raspberry, lime, and lemon varieties of the gelatin dessert that wiggles, I’m also going to give you the 411 on which ones are the MOST. I personally thought the raspberry-bourbon Jell-O shot was the best. The lime and tequila number tasted like an incredibly sweet margarita in a good way (the hubs agreed), and the lemon and vodka one was your classic lemon drop. The man in my life decided the lemon drop one was the best (it totally wasn’t unless you’re pledging), then the margarita version, and he kind of gagged on the raspberry bourbon. But I’m telling you — raspberry bourbon is a winning combination. For reals, here’s how you do it. 1. Pour gelatin into a bowl, add boiling water, stirring until the gelatin is dissolved. 4. Pour into shot glasses to set, approximately 2 hours. 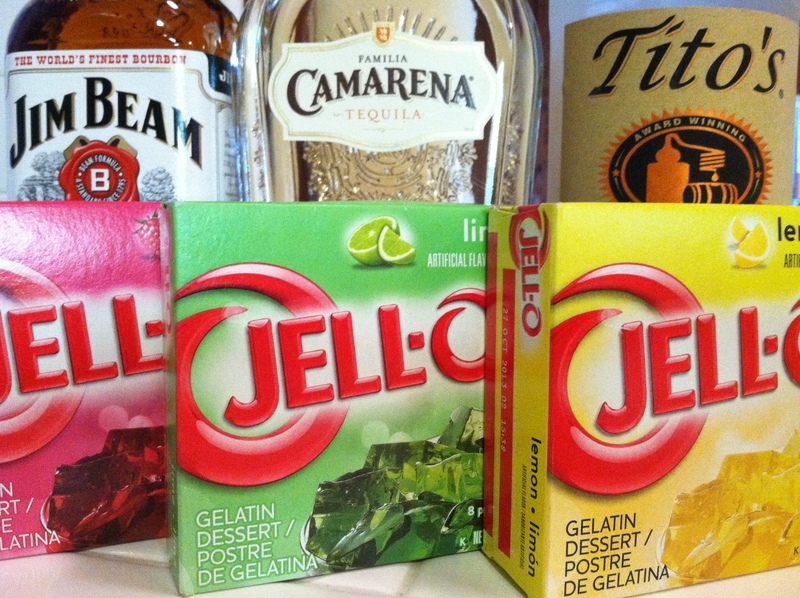 Tags: gluten free junk food, gluten free recipes, gluten-free alcohol, gluten-free jell-o. Bookmark the permalink. Uhh, Jell-O is not gluten free. Jell-O is ALL gluten. Please check your facts before you post them online. Kraft Jell-O — as seen in my photos and recipes — is gluten-free. Please check before you post and unnecessarily scare people. According to my nutritionist, and many other gluten-free resources. Ingredients: SUGAR, GELATIN, ADIPIC ACID (FOR TARTNESS), CONTAINS LESS THAN 2% OF ARTIFICIAL FLAVOR, DISODIUM PHOSPHATE AND SODIUM CITRATE (CONTROL ACIDITY), FUMARIC ACID (FOR TARTNESS), RED 40, BLUE 1. But Gelatin is know to be a gluten item right?? No. See below. There is not gluten in gelatin.